BAL BHAGWAN JI IN AUSTRALIA! Sixteen months without Darshan came to a sudden, blissful end with the arrival of Bal Bhagwan Ji on Thursday, 21st March, at Sydney International airport. His plane from Honolulu touched down out of a clear blue sky which for a week beforehand held storm clouds and heavy rain. 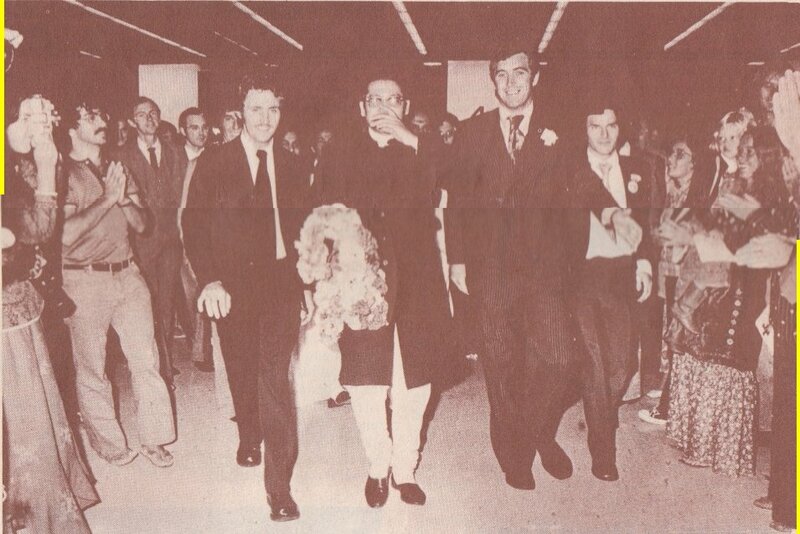 As Bal Bhagwan Ji cleared customs, the Shri Hans film crew waited impatiently in the press room while the media interviewed a Turkish entertainer billed as a hybrid of Liberace and Danny La Rue. The tailend chaos of that encounter was magically cleared by the shining presence of Bal Bhagwan Ji. The room stilled, concentration was restored, And the room stilled, concentration was restored, and the press adopted a more respectful attitude. Bal Bhagwan Ji shook hands with the press, while the Shri Hans interviewer melted into the sofa. Most of the questions, as usual, were directed towards money and weight but Bal Bhagwan Ji transformed them to light and love. He said He would be in Australia for about two weeks. When asked if He was here to tighten up the Mission organisation, he replied, "No, not at all. It's very free, just like a movement, it's not even a religion, it's like a movement". He talked mainly about the uselessness of constructing images of Guru Maharaj Ji and the positive influence of knowledge on people's lives. When the interview came to an end, a photographer asked Bal Bhagwan Ji to pose behind a garland. After the picture was taken, Bal Bhagwanm Ji blessed the unrealising gentleman by placing the flowers around his neck! Outside, two hundred overwhelmed premies sang the praises of the Lord as Bal Bhagwan Ji, accompanied by Mahatmas Rajeshwaranand and Padarthanand, walked amongst them and into a "white limousine bedecked with flowers", as the morning paper put it. Bal Bhagwan Ji was manifesting so much love, laughing and smiling most of the time. In Australia we had preconceptualised from satsang and film an image of the Lord's oldest brother as an almost stern, reverend organiser and intellect. As often happens with the Knowledge, our minds were blown wimpletely by the actual reality. One cannot describe the compassion and peace that a member of the Holy Family emanates. Bal Bhagwan Ji's day was spent resting at the Divine Residence, Mosman. That night a program was held at Mosman Town Hall. The regional band and choir, christened, 'Harbinger' by Bal Bhagwan Ji, were followed by powerful satsang from Mahatma Rajeshwaranand. Finally Bal Bhagwan Ji arrived and gave beautiful satsang about the importance of meditation. a quick inspection of the National Headquarters in Wentworth Avenue. Two delighted Mahatmas invaded a health food store specialising in Indian delicacies while Bal Bhagwan Ji visited Bondi Beach, famous for its shining sands and effluent discharge pipes. Once again Bal Bhagwan Ji graced us with His presence at the Mosman Town Hall program that night. The next day, satsang was held in the hall at National Headquarters. Mahatma Rajeshwaranand gave satsang for two and a half hours about the sanctity of taking Knowledge and the importance of devotion. Bal Bhagwan Ji visited the Divine "Golden Seed" Farm, looked through every room of the house and walked round the fields twice. He discussed farming with the premie residents and left them totally blissed out. Again He attended the night-time program at Mosman where His satsang was preceded by the words of our resident saint, Mahatma Padarthanand. Sunday was a very holy day, spent entirely at the Residence. 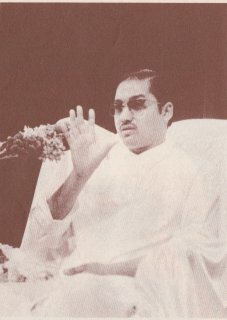 In the morning Bal Bhagwan Ji watched two films, "The Peculiar People", a record of the Australian Guru Puja, and two showings of "High as a Kite", a piece of avant-garde animation about the more cosmic effects of Maharaj Ji's Knowledge, which Bal Bhagwan Ji described as "progressive film making". He discussed movies with the Shri Hans Productions team and gave many ideas for a feature film depicting a man's search for and discovery of peace. That afternoon a beautiful program was set up on the tennis court. Bal Bhagwan Ji gave satsang and 'formal pranam' Darshan. After the program Bal Bhagwan Ji was going to do a video interview but after about fifteen minutes during which He described different aspects of the Bible, He changed His mind. On Monday He was interviewed by TCN-9, a local television station. Bal Bhagwan Ji then took the Mahatmas and a crew of premies on a heavenly harbour cruise. That night's program was publicly advertised and the Mosman Town Hall was packed. He left a rapt audience with these words, "If you're looking for peace, keep searching, and good luck". 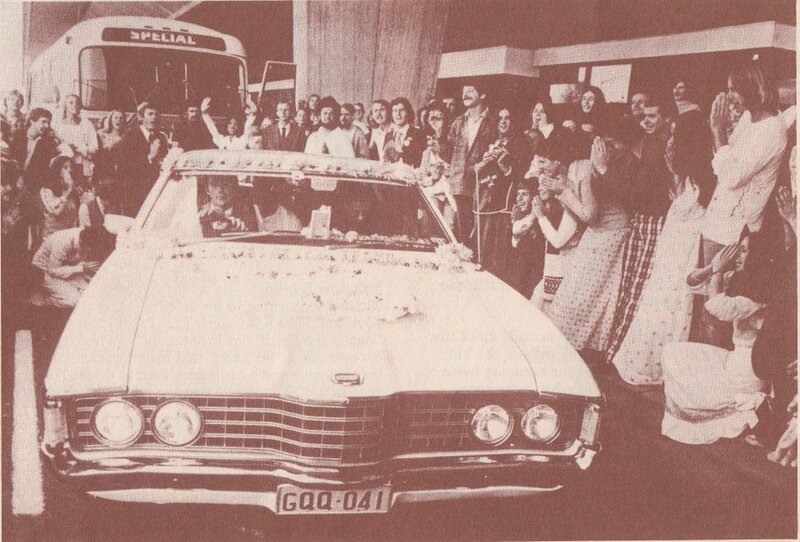 By Tuesday, we were just beginning to realise that this was the "special, amazing Darshan" Guru Maharaj Ji had mentioned to the Australian delegates at Millennium. Bal Bhagwan Ji had played and laughed with us so much and it was time for Him to go. He had brought an incredible joy into our lives and a loving ache into our hearts with His absence. That afternoon He left for Brisbane, on the first leg of His tour of Australia. We can only wait hopefully for His return, the return of Knowledge personified.